Sir Peter Blake’s work reflects his fascination with all streams of popular culture, and the beauty to be found in everyday objects and surroundings. Many of his works feature found printed materials such as photographs, comic strips or advertising texts, combined with bold geometric patterns and the use of primary colours. The works perfectly capture the effervescent and optimistic ethos of the sixties, but are also strikingly fresh and contemporary. There is also a strain of sentimentality and nostalgia running throughout his work, with particular focus towards childhood innocence and reminiscence, as can be seen clearly in his recent Alphabet series. Blake is renowned for his connection with the music industry, having produced iconic album covers for the Beatles, Paul Weller, The Who, and Oasis. During the 1960s and 70s Blake taught at various institutions such as St. Martins School of Art, Harrow School of Art, Walthamstow School of Art and the Royal College of Art. He also exhibited his work in many individual and group shows during this period, both domestically and internationally. In 1961 Blake won the John Moores Award for his work Self Portrait with Badges, and was also featured in Ken Russell’s BBC film on Pop Art ‘Pop Goes the Easel’, which first brought him to wide popular attention. In 1969 Sir Peter Blake left London to live in the West country where he was a founding member of the Brotherhood of Ruralists in 1975. He continued to live near Bristol until 1979 and during this period his work moved away from the glossy commercial pop art for which he is most celebrated and focussed on literary and rural subjects in oil. 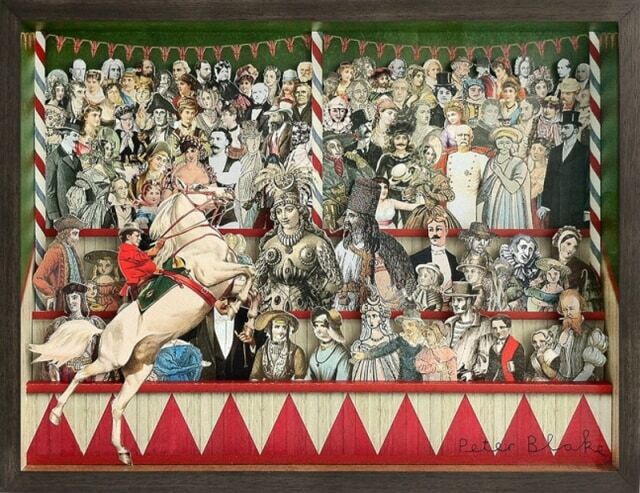 Sir Peter Blake moved back to Chiswick in 1979, upon his return to London his work reverted to the earlier popular culture references that had been his dominant inspiration before his rural period. He still resides and works in Chiswick, maintaining a prolific output of work. He was elected a member of the Royal Academy of Arts in 1981, and a CBE in 1983. There was a major retrospective of his work Now We Are 64, at the National Gallery in 1996, as well as at Tate Liverpool in 2007. Sir Peter has designed fabrics for Stella McCartney, as well as the carpets in the new Supreme Court. In 2012 he has re-designed the BRIT award statuettes and produced a portrait of the the Queen commissioned by the Radio Times to celebrate the Diamond Jubilee (which appeared on its cover). He is currently working on a series of jacket designs for Penguin books, he has also been commissioned to paint a canvas of St. Martin for the Knights Chapel in St. Paul’s Cathedral- the first new artist to be included for several hundred years.